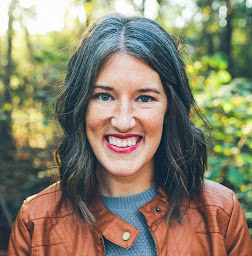 Two weeks ago, I threw a tantrum that was the result of two pretty rough months with the kids. It was Sunday, we were making lunch, kids were hungry and crazy, Nova's ear was hurting, and then there was a last straw. "I can't take it anymore!" I yelled. Then I threw something and ran to the garage to have a good sob. After my tantrum was complete, I went back inside, finished the afternoon duties, apologized to my peoples, and took a long nap. I had hit my end that afternoon. There have been several times in the past 3.5 years that I have felt I was at my end. There have been lots of kinds of Ends. Postpartum Depression Ends. Breastfeeding Ends. I Just Want to Do What I Want to Do Ends. If One More Tiny Human Whines or Cries I'm Going to Move to an Island Ends. And now ... I've got an extremely spirited little boy and a 1 year old who has consistent ear infections. That was my new End. I woke up every day knowing exactly what my hurdles would be, and it was exhausting. I'll catch you up really quickly. Duke is boy and he is 3.5 years old. I probably don't have to say much else to you veteran moms. Those two facts alone provide you with all the information you could ever need. But I'll fill you in anyway. Up until a few months ago, all of my disciplining methods, while still hard at times, have always been effective. But there was a new world we'd entered into - sudden tantrums, crying, screaming, and yelling. Attitude. (The "terrible twos" have nothing on the three-nagers.) It seemed like there was just nowhere else to go - no new consequences to try for negative behavior and no new ways to reinforce the positive behavior. Sure, there were still sweet moments and there were some easy days here and there. My heart still melted when we read books, he told me he loved me, he brought Nova's empty bottle to the kitchen for me, he hugged his friends, he asked thoughtful questions. But a lot of the time, I walked around with all buttons pushed and my cup of patience completely emptied. On top of that, Nova had just finished up ear infection #3 since getting her tubes a little over 2 months ago. She hasn't been without ear infections since probably October. She's learned to live with them, yet continues to be a very happy baby. But still - that does crazy things to a little baby and her mama. I hate everything about it. I hate the ridiculous amount of money that we have spent on copays, tubes, antibiotics, and ear drops. I hate that I have to take her to the doctor all of the time. I hate that she has been getting antibiotics shoved in her mouth constantly for the past 8 months. It just stinks. I know these problems are small in the big scheme of things. But in my day-to-day life, they have been big. I felt like I was living in a storm. There was nothing I could do except hunker down and let it pass. I continue to be consistent, but I wait until Duke grows up or starts responding differently, and/or I learn the perfectly tailored discipline method for him. I continue watching for any sign of infection, but I wait until Nova's ears develop or until we hit a point where a next step needs to happen. Two weeks ago, I would've told you it was one of the lower, more numb, alone, don't-know-what-to-do places I've ever been in with motherhood. But in the past week, I've experienced a bit of a shift. I've seen improvements in Duke's behavior. He's hardly had any explosive fits and has been a lot better about talking through things rather than freaking out. As for Nova, she's been done with her most recent antibiotic for almost a week and hasn't tugged at her ears once! She has been incredibly happy and it has been such a gift to see her this way - content without any antibiotics. This is her true, normal self! We're living in a teensy little bright spot and while I won't bank on things being perfect forever, it's a nice reminder that things do change. It's so hard to remember that when we're in the muck of it. Something I'm really working on is trusting God, seeing the good, and finding the joy in the hard circumstances. Isn't it so much easier to do all of that after it's all passed? While it's still valuable and necessary to reflect on things after they've happened, I think there's also something special hidden in the actual storm. I've felt like I was in the middle of a raging storm for the past couple of months. I know some of you feel the same way, and you're not sure how much longer you can hold on. I know a lot of us are in the "waiting for the storm to pass" season. Moving forward with life when it hurts, healing wounds, trying to forgive fully, shouldering a load that is hard for one person to carry, stepping into a new and scary role, trusting when there is no end in sight. There are some things we just have to ride out. Some things take time and there's no getting around it. We know/hope we'll get to the other side, but most of the time there's nothing we can do to speed up the process. We just have to wait. These kinds of "storms" in our lives are not pointless. Even though it sounds incredibly cliche, there is a reason for them. And if you try and figure it all out right now, you probably won't able to. We just have to rest in the fact that God turns all things around, he makes things new, he redeems things, and he gives us just what we need to make it to the next moment. 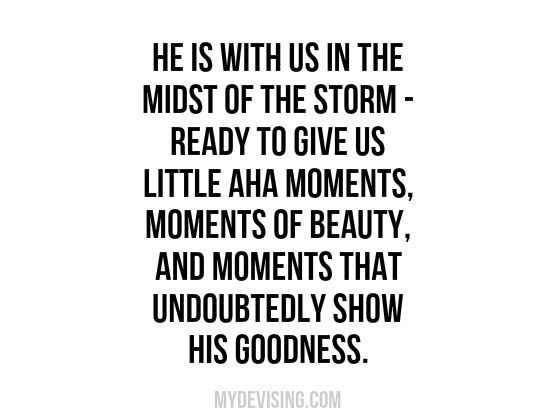 So for you and for me, as we wait for the big and small storms to pass in our lives, let's remember to go to God. To let him be our comforter, to ask him for help, and to be open to whatever it is he's trying to show us, teach us, or change in us. 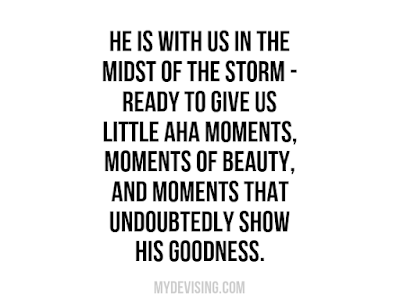 He is with us in the midst of the storm - ready to give us little aha moments, moments of beauty, and moments that undoubtedly show his goodness. he gives us just what we need to make it to the next moment. <--- love that. So true, but I often forget it. Thanks for the reminder!